iBash is the Cade’s premier annual event where we celebrate ideas and innovations that transform our lives and our community. This year’s iBash theme is Illuminating Invention and you are encouraged to incorporate Illumination into your attire! The evening's program has been designed for exploration whether you are a scientist, inventor, or have an interest in both. 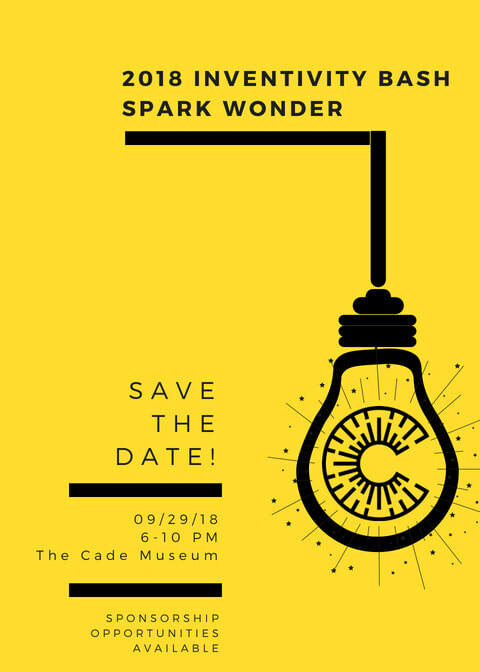 There will be table presentations featuring the 9th Annual Cade Prize Final Four teams, fun demos and hands-on interactives, a scavenger hunt, and the awarding of the Cade Prize. Purchase your tickets today! The 2018 Inventivity Bash will be on Saturday, September 29th, 2018, 6 to 10 P.M.